This vibrant multi-colored dress is as bright and cheery as a rainbow. The End of the Rainbow Dress has a sweetheart neckline and wide shoulder straps. The top is made of a stretchy bandage fabric featuring wide bands of fabric that crisscross, forming a unique design at the bust. The attached skirt is made of a multi-colored green, cream, and pink chiffon fabric with vertical pleating throughout. The skirt is fully lined. A hidden back zipper completes this dress. The End of the Rainbow Dress is a unique and fun summer look that looks great paired with black or beige pumps or wedges. 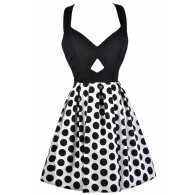 This is a cute summer party dress. Details: Skirt is fully lined. Hidden back zipper. 90% polyester, 10% spandex. Hand wash cold. Lay flat to dry. Do not bleach. Cool iron if needed. Small measurements: Length from top of shoulder to hemline: 32". Bust: 30". 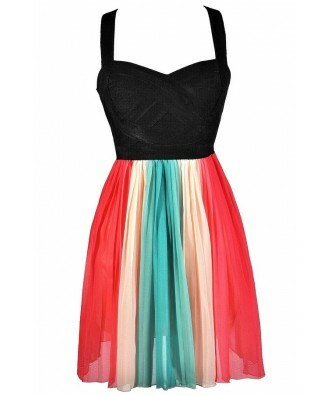 You have added End Of The Rainbow Dress in Coral Pink/Green into Wishlist. You have added End Of The Rainbow Dress in Coral Pink/Green for Stock Notification. 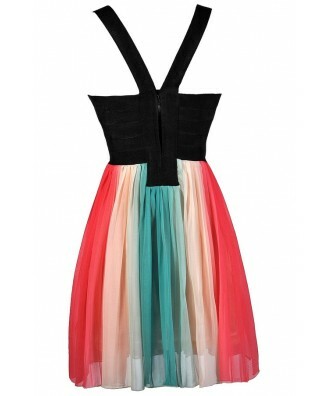 You have set End Of The Rainbow Dress in Coral Pink/Green as a loved product. 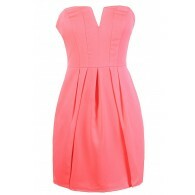 You have removed End Of The Rainbow Dress in Coral Pink/Green as a loved product.